1 – God loves you. Yes, you. Personally, unconditionally and with unbridled delight. No matter what you did or didn’t do in the past. No matter what you do today, or don’t get done tomorrow. He knows all about it and He still love you. The real you. 3 – Your spouse’s job is not to make you happy. No one can make you feel anything. We choose our feelings. I know as a woman, you’re probably going to disagree with me, but we “feel” based on the stories we tell ourselves about a given situation. If you tell yourself your spouse is ignoring you because he’s tired and had a bad day at work, you won’t feel too bad about his lack of communication. If you tell yourself he’s ignoring you because he doesn’t respect your thoughts or opinion, you’re going to feel angry. Take time to think about the assumptions and expectations you are putting on other people and ask yourself if they are realistic. Putting pressure on another imperfect, faulty human to always know and to do exactly the right thing to make you happy is, well, a nice romantic dream, but unworkable in the long run. That is not to say you should live with someone who is cruel, demanding or abusive and just put up with it! I’m talking here about the little day to day irritations that we let get to us until they build up into an all-out explosion. 4 – On subject of happiness, life is not about the search for perfect happiness. Life is about finding Joy. Happiness is fleeting. Happiness is an unexpected day off. Happiness is the offer by your best friend to take the kids for the weekend. On Monday morning, faced with lunches to make, laundry to do and a demanding boss, the happiness is gone and the search has to start anew. Joy can be with us in any situation. 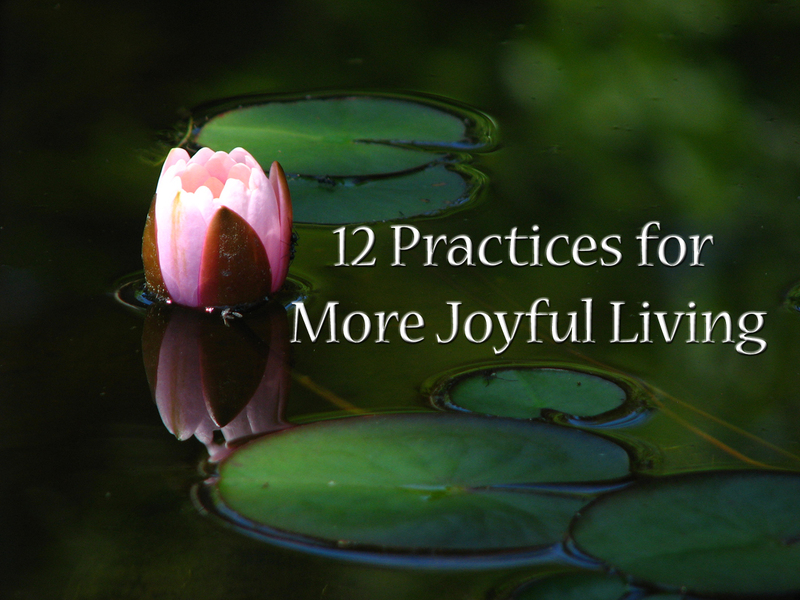 Joy is a fruit of the Spirit of God living within us. Joy never runs out, it never fades away. When our roots go deep in the Lord, the flow of Joy does not end. It sustains us even through sorrow. It gives us hope for a better tomorrow and peace in storms. Happiness is fun, God is not against our being happy, He’s been known to send happiness our way J But, He knows that in the long run, Joy can fulfill us and save us. Seek Joy. 5 – You are not doomed to a life of doubt and worry. You are not a failure. Christ has given you a new identity and He gives you the ability to leave that old one behind. 6 – You deserve respect and love. You do not have to live as a doormat. You do not deserve abuse or cruelty. You did not deserve to be treated the way you’ve been treated, it is not your fault and it is not your burden to bear. Christ took all of those burdens, even the burden of shame, to the grave. It’s already gone, you just have to let go of it and trust Him to fill that dark place with His love. 7 – Your value is not in your looks or your body size. You don’t need to look like a movie star to be beautiful. In real life even the movie stars don’t look like movie stars without Photoshop! 8 – The Christian life has been referred to as a race. The word for race in the scripture actually means competition, more like a wrestling match than running a straight line to the finish. There are set-backs and detours along the way. And that’s okay! 9 – Facing struggles and stress does not mean God has abandoned you. Sometimes, instead of solving our problems, God’s answer is “come to me.” Use those times of fear and doubt as reminders to seek Him. 10 – Your husband needs your respect. He gets beat up at work. He faces criticism, he struggles to measure up. He doesn’t need to get more of the same at home. The biggest influence you can have toward changing him doesn’t come from tearing him down, it will come as you focus on building him up. Be his cheerleader, not his mom. 13 – There is hope for your wayward child. It is not your fault. There is sin in the world and our children, especially grown ones, have free will to make their own choices. Remember God loves them and wants the best for them even more than you do. Your prayers will make a difference. In God’s way and in His timing He will draw them back to Himself. Hi, Great Reminders. True indeed that “Facing struggles and stress does not mean God has abandoned you” , Seek first his kingdom and all these things shall be added unto you. Thanks for sharing. Great Read. I’m glad you enjoyed the article. Depending on our view of God, we sometimes are lead to believe that if we are not living in perfect health, happiness and prosperity, God must not love us. The bible says to count it all joy when we suffer because we have been found worthy to enter into Christ’s suffering and we will also be worthy to enter into His glory. It’s a hard truth to grasp in the moment of intense sorrow, but it is a great promise for the future. Sorrow may endure for a night, but joy comes in the morning.